We’re shopping for a larger car for some reason. (Cough. Twins. 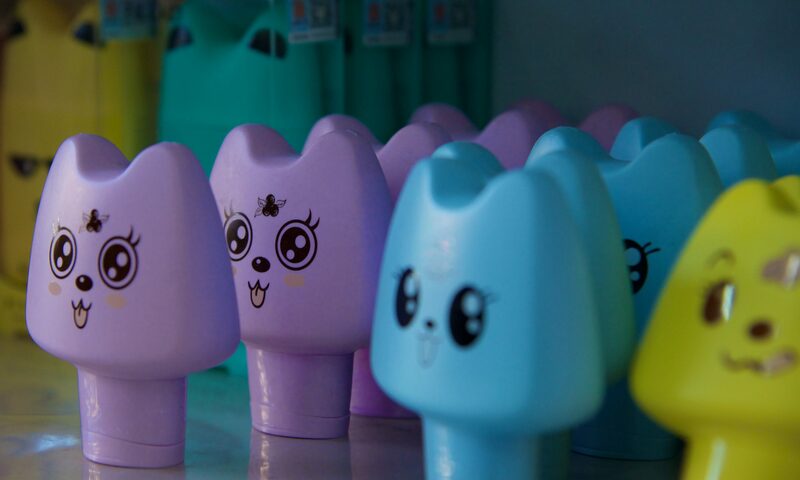 Cough.) And our favored option is the Honda Odyssey. We picked our color and model and then used a number of websites, including Honda and Edmonds, to request competitive quotes from dealers in our general area. 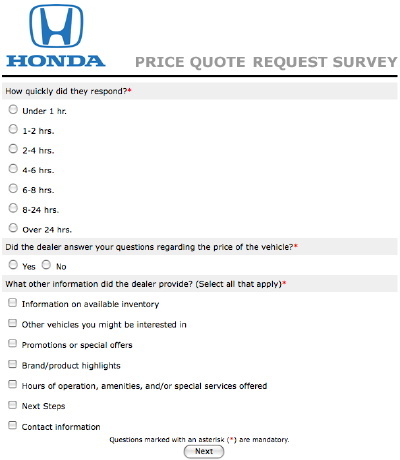 Each of the dealers, or possibly Honda, then asked us to fill in a short “5 minute” questionnaire on the quality of service received. First of all, doing the same “5 minute” survey four times is no-one’s idea of fun. Second, the third question in the survey required me to go and check the timestamps of the e-mail responses, and the fifth required me to carefully parse each response to see what it contained. After trying to skip the third question (mandatory) and seeing what would be involved in answering the fifth, I deleted all the requests from my inbox. Honda, if you’re reading this, I guarantee writing this blog entry will be quicker than answering your stupid questionnaire once. Part of the problem of course is that there’s no .com.usa, so .com serves both as .com.usa and “worldwide” .com. Even so, surely these guys have enough money hire some halfwit web developer to automatically direct folks to the correct country’s information by default, and make it seamless for 99.9% of people, versus retarded for 100% of people. Edmonds.com, as far as we can tell, simply decides you want the EX-L trim level. Um, thanks. Again, not a problem that couldn’t be fixed in a few minutes (OK hours, it’s corporate America). It’s not like Edmonds.com has a huge database of car makes and models just lying around. So, how to wind this rant up? If you’re a multibillion dollar company with a reputation for bleeding edge technology, such as Honda or Canon or Nikon or whatever, it seems to me that it behooves you to get your house in order with respect to moderately dumb stuff, like automated emails, online surveys, and having your web site residing at the more obvious domain. In order to get a clue, consider this simple little factoid. If you impulse buy a bunch of $0.99 songs from iTunes in the course of a few minutes (e.g. you hear a song, look it up, buy it, think of another song you heard recently, look it up, buy that, etc.) then Apple automagically consolidates the transactions and sends you a single receipt. Oh, and apple.com.au gets you to apple.com, not the other way around.